At the BlackBerry Annual Live Conference 2013, BlackBerry CEO officially announced that the BlackBerry Messenger (BBM) will be rolled out to Android and iOS users. Now, this dream is almost coming true as BlackBerry releases the BlackBerry Messenger (BBM) in its beta testing stage. The Android and iOS version of this widely-known instant messenger is now available to some developers and beta users in order to test the app on their Android and iOS devices before it gets rolled out to everyone. In short, the BBM Beta testing is not available for everyone, but if you have received an email like the one shown above then you should know that you just got an invitation to test the App from the BlackBerry team. The beta version of this App currently requires Android 4.0 Ice Cream Sandwich and above OS, while the iOS version runs on iOS 6 and higher. If you are still running a lower version of Android on your Phone then its better you go and upgrade it and get ready for the arrival of BBM for Android. 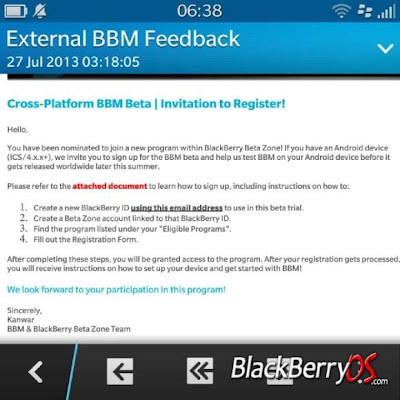 Have you been invited to the BBM beta programme ? As an Android or iOS user, How will you feel if BBM gets to your own device too ? What do you think ? Lets hear from you !!! Just so bad my android runs on a lower android os perhaps when the basic app is released then i would go get a better android phone.